Although the setting for Support the Girls is a tacky, less than appealing restaurant that promotes “family values” and which has a zero tolerance policy on customers who are disrespectful to the waitstaff, this isn’t about the restaurant itself, but about those waitstaff, and their manager, and the sisterhood that they promote amongst themselves. It’s this sense of solidarity, and everyone pulling together, that gives the movie much of its heart and soul, as writer/director Bujalski paints a portrait of ordinary women working in a low paid, low reward job but finding a purpose in supporting each other that makes up for the problems that said job throws at them on a daily basis, whether it be unruly patrons, unfair rules and prohibitions (Cubby won’t allow two black women to work the same shift), or their own unrealised needs and/or ambitions. Lisa does her best to juggle all these things and to keep Double Whammies running as smoothly as possible, but she’s like the classic image of a swan: on the surface she seems able to deal with anything, but below the surface she’s paddling like mad to maintain that semblance of being in control. Adding depth to proceedings are themes surrounding perpetuated sexist attitudes, the socio-economic climate that keeps workers such as these from doing any better for themselves, and how senior management or owners are divorced from the day-to-day realities of managing such a business. These issues are given their due without the need for strident politicising or deftly written monologues bemoaning the current state of employment matters in the US, and this is because Bujalski is focused on how female solidarity allows the staff to feel and be more fulfilled than perhaps they would be otherwise. It’s a positive message given in the unlikeliest of locations, but it’s also the reason why it works so well. These are women who are working in an environment where it’s not just their gender that can come under attack but their sexuality, their physical appearance, their class, their race, and that’s without any challenges to their ability to do the job. That the movie balances all this without being too blunt or obvious, is a testament to the skill of Bujalski’s screenplay, and his confidence in handling the material. It’s also due to the talents of a terrific cast, with Hall giving her best performance yet as a woman doing her best to keep everything going, and by being that rare thing in the movies: consistently nice. 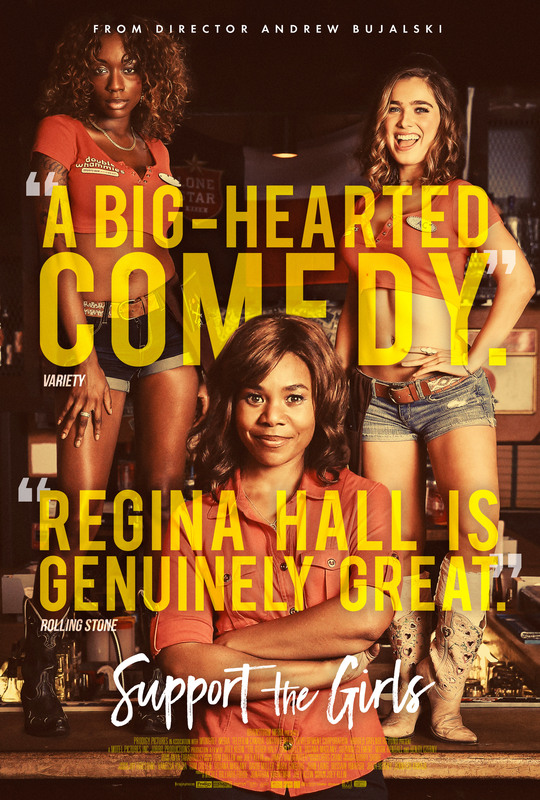 Rating: 8/10 – a comedy that avoids clumsy attempts at satire by being sincere in its approach to its characters’ environment, and their hopes and dreams, Support the Girls does just that, and in an affecting, heartwarming manner; as a snapshot of what it’s like to be a woman in 2018 America, it could be construed as dispiriting, but what it shows instead is that female solidarity is alive and well and ready for anything – and on its own terms.